This document was issued in Boston to the ship Hannibal, which was under the command of George H. Willis. The vessel was heading from Boston to California with a cargo simply described as “merchandise”. The Hannibal was one of the many ships pressed into the urgent service of transporting men and materials to California in the Gold Rush. She left for California 21 months after gold was discovered and the fact that she was carrying merchandise indicates that her owners were seeking their reward by supplying the needs of those in California rather than the risky quest for gold. During the Gold Rush, more than 500 ships arrived in San Francisco and were abandoned as their crews deserted to search for gold. It does not appear that the Hannibal and Captain Willis were among those to remain in California since Captain Willis’ career as a shipmaster continued into the successive decades. This multi-language sea letter initially appears to be unusual since it is only a two-language document. There were very early three-language sea letters but they soon went to the standard of four languages: French; Spanish; English; and Dutch. This document is only in English and Dutch, but it bears the appropriate signatures and seals. Close examination reveals that this is a standard four-language passport that has been cut down. The left-hand portion that should include the French and Spanish texts is missing. It is probable that the left side was damaged and in order to preserve the important portion with the signatures, it was cut off. The evidence of this is in the two fine vertical lines on the left margin. In sea letters of this period, the four language section are separated by three sets of two fine vertical lines. There is a clear margin on the right, but the lines are visible on the left where they would have separated the Spanish text from the English. If it were, in fact a two-language sea letter, there would be a clear margin on the left. The sea letter is signed by President Zachery Taylor who served for only sixteen months before dying while in office. Although a southerner who made his home in Baton Rouge, he strongly supported a nationalist position and was prepared to use military force to keep the Union together when arguments over extending slavery into newly acquired territory threatened to destroy the Union. The document also bears the signature of the Secretary of State, John M. Clayton, who had served both in the U.S. House of Representatives and the U.S. Senate before becoming Secretary of State. Serving such a strong-willed President, Clayton had little latitude in diplomatic affairs and he resigned as Secretary of State immediately after Taylor’s death. The other signer on this sea letter is Adams Bailey, the Collector of Customs in Boston. This was at the time of the Swartwout embezzlement scandal in New York, and in the tightening of Federal controls, Adams Bailey was one of those who was suspected of being “pawns of the banks” and ripe for corruption. 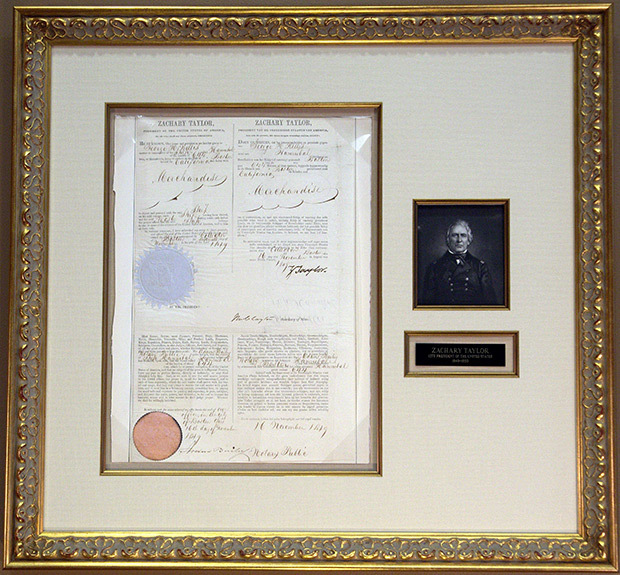 This document is printed of rag paper and, despite being cut down from its original size, bears the Great Seal of the United State on the center left.